What do the other "creditor" states think of debt-pooling? It seems unlikely that Finland, Austria, and the Netherlands would go for it. The Dutch PM has stated publicly that he will veto it even if Germany does a 180. The Finns will demand collateral for the risk they take. So summarised you can take that as a no. What the media largely miss is that this is about paying and everyone has to agree with it. No majorities, even qualified ones, simply unanimity. It is hardly important seen from that angle what Italy and Spain as biggies think as they are de facto not payers (but receivers). Another point is that Merkel has simply no room. Highly likely it is simply unconstitutional in Germany. She also will not risk a referendum on it. Seen the polls that would most likely simply kill Merkel politically as well as the complete Euro rescue. 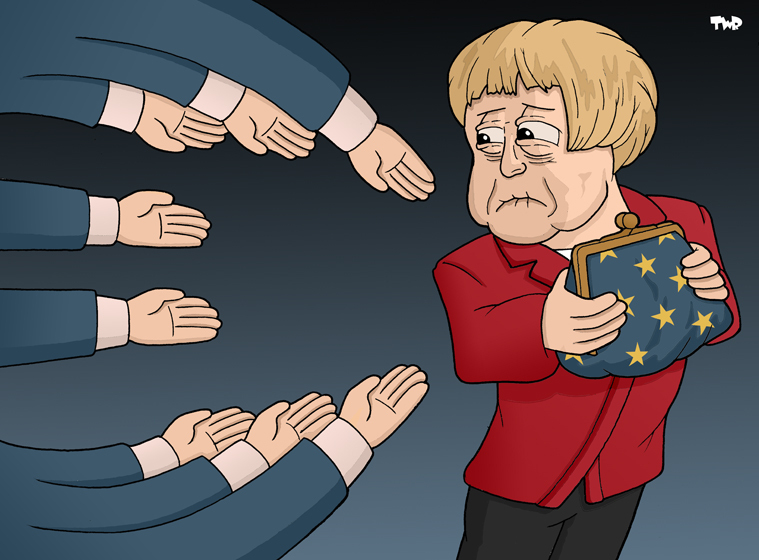 With 80% against and only 10-20% pro it is hard to see how Merkel could survive that and how any German government could credibly still go for bail outs. This all was simply a complete failed strategy. Totally unlikely to have any effect only a waist time. Sp, Fr simply didnot have a clue about the priorities of the people on the other side of the table (while reading a German newspaper could have given them that). Simply sloppy negotiating/preperation. Another point: come together only with the biggies before the meeting and expect Holland, Finland, Austria to come up with several Billions is also unbelievably stupid to say it friendly (Sarko made that mistake earlier as well but saw it lateron and changed it and paid much more attention to the small AAAs). The new French guy is simply repeating this early mistake (so looks more like a blunder now). Your message (the last two paragraphs in particular) leaves me kind of speechless. To me it seems that the people in charge are a bunch of morons if they expect the smaller AAA countries (and Slovakia) to foot the bill without even talking to them BEFORE the summits and without any sense about was is going on in these countries when it comes to the Euro. ps: Is Open Europe going to cover the upcoming elections in the Netherlands? This debt pooling is a joke. For a start, Germany already has a national debt similar to ours in proportion, but much bigger: 2 Trillion. But all these efsf and esm 'funds' do not exist. All the indebted nations promise to chip in, to reduce other undebted nations with lower interest rates, but have to borrow to do so at higher rates. Go to your bank and ask for a loan: when they ask for security, ask them for a further loan to secure it, Hahaha. b) the real money has to come from the smaller AAAs. My mother always says you catch flies better with honey than with vinegar. You should simply give them the impression that they are important and their ideas count. Merkel/Germany have frequent pre-summit meetings with the smaller AAAs, and especially Holland. Last Wednesday for instance), when it was made clear that Merkel's definition of political union was a completely different one from the one most Anglo-Saxon /International media are giving of it. Dutch election (I think Open Europe will cover it especially when it could become interesting) Open Europe usually covers the main events. And much better than nearly all other media give a lot of attention where attention should be paid. A lot of other media give a new idea of Barroso a lot of coverage (while it is likely to be dumped) while developments with the real decisionmakes are neglected (mainly because they are not in English). Look at Rompuy's plans all over the papers, while Merkel's remarks and the German parliamentary discussion had hardly coverage although considerably more important. It is at the end simply:'Who pays the piper...'. In Holland anti-Euro (and very Euro-sceptic)parties are now at roughly 40% in the polls and the trend is rising. Also the main government party (VVD) has to move more to the anti-Euro block, because the party that is likely to pick a lot of its usual votes is simply anti-Europe and campaigning on it, (Wilders). Same story but in a lighter form on the left. The middle block however is stil pro bail out. And likely to win the majority. However it consists out of 6 parties I believe , from the right liberals on one side to the Greens and rather old fashioned socialists on the other. No natural coalition-partners. In my idea the next bunch of measures likely will be approved by a new Dutch government. But it is difficult to see something like Eurobonds or massive bankguarantees being approved a considerable majority is against and spread over all major mainstream parties but 1 or 2 (and Holland has probably more than 10 in parliament). Rik, thanks a lot for your answer. I totally agree, that mainstream mediae even here in Germany have been doing a pretty bad job since the debt crisis hit center stage. To me this seems to be pretty symbolic for the lack of an european public society. Thanks again and I'm looking forward on your take on the results (or the lack of) of the EU summit.